Are you looking for a cheap Sat Nav? Our deal hunters look for the biggest TomTom and Garmin price drops to help you save money. While Sat Navs have reduced in popularity since Google Maps and other apps have become available on smartphones, some people still prefer the handy device kept in the car. Navigate your way around the country with ease - plus download extra maps for Europe and other countries around the world. Sat nav’s popularity has increased in the past years. Prices have dropped and we’ve seen major improvements on its functionality, screen size and its touchscreen technology. If you’re in the market for a new or an upgrade to your old sat nav and you’re also looking for sat nav deals, then you’ve come to the right place. Our buyer’s guide will provide you with all the information you need to know about the latest sat navss and what features you need to lookout for in order to find the perfect one to meet your needs. In addition, here at Latest Deals you will also find the latest sat nav deals, offers, voucher codes, coupon codes and sales found by our community of bargain hunters to ensure your budget is taken care of as well. What is a sat nav? A satellite navigation device or sat nav is an electronic gadget used by most motorists for providing them with directions to a specific destination. From your current location, it will calculate the best possible route. GPS is being utilized by this gadget to work out where you are and you have to type in the postcode or address of your destination. Most sat navs nowadays have touchscreens just like with mobile phones. Sat navs have a reputation for leading drivers to where they shouldn’t be. But with today’s improvement in technology combined with functionality, a few simple clicks and you’ll get directions to the address you entered, including you’re the time estimate of your arrival as well as any other information you need if in case there’s a need for you change your route. There are even models where it’ll provide you details on the nearest car park upon arrival. Some current sat nav models also come with a variety of features such as calculating the quickest route for a certain time of day to avoid those pesky traffic jams. Keep in mind thought that the best sat nav and navigation applications should get you to your destination and lessening any hassle. It can cope smoothly with any delays or disruptions en route and are easy to install and simple to use. What are the different types of sat navs? Portable. This self-contained small units are the most common and are typically mounted on the car’s windscreen with the help of a sucker pad. To keep it charged to help you on longer destinations, you can plug it into the car’s cig lighter. You can also remove it to use in your other vehicles. Built-in or integrated. You can often find this sat nav unit in high-class cars and it is fitted permanently into its dashboard. It comes with a larger screen and is fitted neatly without any wires. The downside of it is that you can’t remove it and keeping it up to date is not always that easy as the portable type. Mobile or smartphones. A lot of smartphones today features a built-in GPS system that allow people to run navigation apps, therefore transforming them into sat navs. One of its main advantages is its portability as well as reducing the amount of gadgets you need to carry around with you. Although there are free apps, if you want a more savvy navigation app you have to purchase it on the app store of your mobile phones. How much does a sat nav cost? 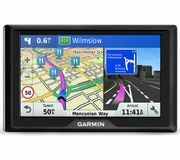 Portable sat navs usually cost around £50 to £300, while sat nav Garmin apps and apps for other brands as mentioned earlier can be downloaded for free to about £50. There are plenty free sat nav apps like Apple Maps and Google Maps and other apps you can buy for less than £50. Where can I find sat nav deals? 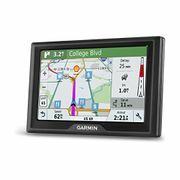 If you’re looking for great sat nav deals, check out and see what our bargain hunters have posted here at Latest Deals. You’ll find the best possible deals as well as sales, offers and voucher codes from a wide selection of sat nav brands both in-store and online from retailers across the UK. In addition, here are some sat nav deals from various retailers our bargain hunters have dug up to help you navigate your way to amazing savings. Sat nav Tesco: Locate the perfect route with Tesco’s range of sat navs. The retailer offers brands like Garmin and TomTom. You can save around £20 to £60 on select sat nav TomTom models as well as get Clubcard points. Also for more choices, they offer more buying options from their third-party partners where you can even get free delivery. Sat nav Currys: Currys offer core, traffic and advanced sat nav ranges for different types of vehicles. You can get savings ranging from £11 to £40 and free delivery on select products as well as a 2 year guarantee. The retailer also offers flexible credit options on most of the items on their website so if you can’t afford to pay upfront, this is an ideal option for you. 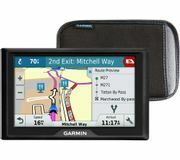 Sat nav eBay: Pick up a sat nav from eBay’s massive selection that comes with fantastic low prices. They have sat navs that even cost less than £20 that includes free delivery. Before purchasing anything, make sure to double check the seller’s ratings and reviews. Always ask for the real photos of the item instead of something that was downloaded from Google and if possible ask for a video showing the product in action just for added precaution. Halfords sat nav: Halfords offers sat navs for car, HGV, caravan and motorcycle. Choose from the best sat navs with great discounts ranging from £10 to £60 on select items plus they also have a price matched deal, so if you find a deal on the same item which is lower compared to theirs, they will match it. Also, the best time to shop for sat navs at Halfords is during January, it’s when they have their “The Big January Sale” where you can get 20% off selected in car technology. Widescreen. A sat nav with a widescreen has a bigger display that can show more information all at the same time. A regular sat nav screen is 3.5in, while a widescreen model has a 4.3in display or even wider. If you’re always using it, adding extra on cost will be worth it. Mapping. You can get one with UK mapping if you’re only driving around the country. Extra maps will add more on cost. Map updates are normally available every 3 months or so but this is not for free. Routing. This is the heart of a sat nav’s function. When setting up your destination, most sat navs will let you enter addresses or postcodes while there are units now that comes with voice recognition that lets you simply tell your destination. Directions. Every year new intelligent and sophisticated sat navs are being produced. There are some which can update routes real time based on live traffic info it receives through its built-in mobile data unit. All units have the ability to automatically re-route when you’re driving. However, there are some sat navs that can read street names when you give it directions instead of just simply telling you to turn left. To make it even easier, there are some units that features 3D mapping images of cities and major destinations. Traffic information. Sat navs come with 2 types of traffic info. TMC is the most common which receives info through FM radio and is free to use. Most of the time it is out of date though and not that useful at all. The other traffic info system, which is the best, is the mobile phone network. As soon as it’s available, data is received via your mobile phone or via your unit’s built-in mobile phone. Points of interest. These are stored in your unit and when you’re nearby, it’ll show on your map. Popular points of interest (POIs) include hotels, speed cameras, restaurants, cash machines, car parks and petrol stations. Driving aids. This is another feature that makes driving a lot easier. Current speed limit and lane guidance will be displayed on the unit’s screen. Numerous sat navs also features Bluetooth which lets you use it hands-free through your mobile phones that are Bluetooth enabled. Waze: A free app available for IOS and Android phones. Waze lets you share useful information with other drivers on the road. You can even report hazards, road alerts and accidents real time. It also provides you with information on nearby petrol stations as well updated fuel prices. TomTom UK: You can use this IOS and Android app even when you’re offline. You can download a map when you’re connected online and use if offline. The cost of this map is £40.99 for Android and £39.99 for IOS. However, map updates are free and TomTom usually run regular promos. CoPilot Live: This app is also available for both IOS and Android. If offers 3 alternative routes for each of your destination and you can even select if you want to view it in 2D or 3D. It costs around £19.99 for both IOS and Android but there’s a free 12 month Active Traffic feature that provides a calculation of the fastest route when there’s a traffic jam.